Anything you want to know from Taiwan’s president? On Friday morning, President Ma Ying-jeou will give an English press conference for the Taiwan Foreign Correspondents‘ Club. Like all members, I will have the chance to ask him one question. What would you suggest? What do you want me to ask Ma Ying-jeou? Please leave a comment with your suggestion. Only serious suggestions. I will not publish anything else here. No arguing. I am only interested in suggestions. Not too uncritical. Even if you like the man or his politics, I believe that journalists should always have a critical attitude towards those in power. Also, it would be a wasted opportunity. Not insulting or confrontative. Even if you dislike the man or his politics, he is a duly elected head of state, and foreign media ought to respect his status. Not too predictable. Ma is a seasoned professional when it comes to dealing with media, and you can be sure that he has a lot of stock answers prepared in the back of his head. Not too long. Everyone only has 30 seconds to ask his question. Your comments will appear after I’ve approved of them. No need to post more than once. I will take all suggestions into consideration and then try to ask Ma the question I find most interesting on Friday morning. Please note: There is no guarantee that I can actually ask a question. The whole event is limited to an hour, and the moderator will select questions through a show of hands. There will probably not be enough time for everyone to ask. In any case, I will try to post a video of the whole press conference as soon as possible. 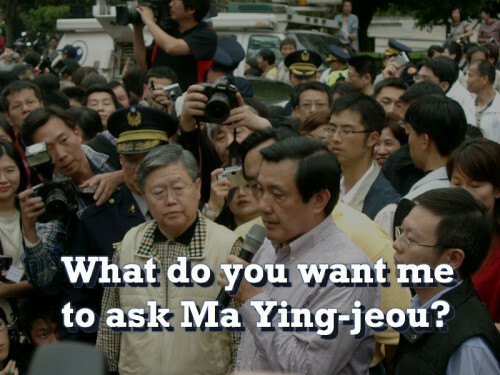 Over the years, I’ve seen Ma Ying-jeou address the foreign press in English on at least five occasions. 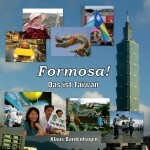 It was even featured on an Al Jazeera program in the run-up to Taiwan’s 2012 presidential elections. What did the scholars say about Taiwan’s human rights situation? New highway to spoil Taiwan’s East Rift Valley? Since Morakot, which measures has the Taiwanese government taken to improve disaster readiness? How can the rights of indigenous people be strengthened against land developers? … it’s impossible to interpret „we“ as meaning anything other than „Taiwan.“ Not that he believed himself. He was only saying what would benefit him politically. Ma’s recent statements about relations between Taiwan and China not being international clearly contradict his 2010 statement about Taiwan being independent. One: If the Constitution calls for unification, and the KMT supports eventual unification, and you yourself have said ties with China „are not international,“ then, given the right circumstances, do you aim for Taiwan to unify with China? Two: Even though The Gambia is the first ally to break off relations in years, countries that recognize the ROC have only decreased over time, not increased. President Ma, what do you say to critics who argue that Taiwan’s foreign policy „status quo“ is not sustainable in the long run? Three: As Taiwan faces a demographic crisis, what is the government doing on a national level to encourage a raise in birth rates? Four (My only serious suggestion): What is the single biggest challenge facing Taiwan over the next 10 years, and what can be done to face it? If you have a time machine that will bring you back to beginning of the year 2013; What would you have done differently this year? What is Your vision for the country in 4 years when you were re-elected in 2012? Is the envision still on track? is the vision adjusted / changed now? A group of international human rights experts visited Taiwan earlier this year and made 82 recommendations. How many of these recommendations have been acted on? I support this question. Straight to the point. Thank you for involving us and keeping us up-to-date. – Thank you and best regards! It’s not as much about „violations“ as about fulfilling the requirements of the conventions that Taiwan chose to sign voluntarily. The experts applied the same criteria for their evaluation that the UN Human Rights Council also uses. Good question, the answer not quite so good: (Ministry of Justice and other related bodies)“…making sure, whether…“ . Perhaps he better should have answered that question in Chinese. The rest of Ma’s press conference (Q&A with answers in Chinese) is online here: https://www.youtube.com/watch?v=2B5QweBJjek Jump directly to the individual questions with the links in the video description.